In the time since I wrote Physical Modeling Synthesis for Max Users: A Primer, interest in its use by musicians from all points of the compass has continued - most recently, it's made its way into analog synthesis rigs everywhere, courtesy of Mutable Instruments' Elements and Rings modules. As with their software counterparts, a good deal of the design issues associated with the creation of these new analog modules involved careful consideration on questions of the interface - how do you create a simple and straightforward interface that still allows you to really investigate the world of possibilities that physical modeling offers? 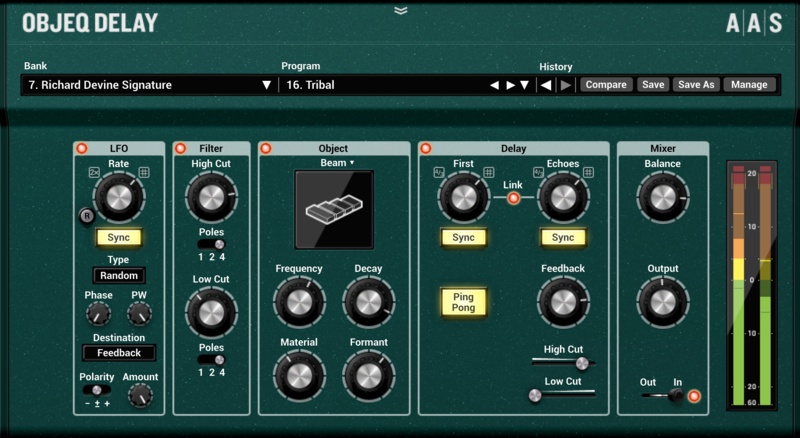 This week, I'd like to introduce you to a new VST/Audio Units plug-in from Applied Audio Systems that combines their previous expertise in the field with some filtering, delays, and modulation to create a really interesting piece of work: the Objeq Delay plug-in. If you’re familiar with AAS, then you know their previous work with physical modelling- the Tassman modular sound synthesis environment and, more recently, the Chromophone 2 acoustic object synthesizer. The Objeq plug-in builds on that earlier work in ways that will make Chromophone users feel right at home from the git-go. Simply described, the plug-in combines input filter/dual delay line processing with a set of resonators based on the physical models you find in the Chromophone. And if you're specifically familiar with the Mutable Instruments Rings module as a decoupling of the resonators from the more fully-featured Elements physical modeling analog module, you'll have a pretty good idea why it's an interesting approach. The direction of signal flow in the Objeq Delay is straight-ahead: The input passes through a filter module that provides both low and high-cut filters, each of which can be set to one, two, or four-pole output (6, 12, or 24dB). As with any of the audio processing portions of the plug-in, you could just turn this bit on and use it fro discretionary filtering all by itself. The filtered (or unfiltered) result can then be used as an excitation source for one of the Objeq plug-in’s four physical resonator modules: a beam (bar), drumhead, plate, or string. In keeping with AAS’s simple and straightforward physical model interface design, you’ve got four controls – the resonator model’s base frequency and rate of decay, a material parameter that lets you adjust the decay time of the model’s upper partials with respect to the base frequency (although that may sound complicated, your ears will tell you what’s going on right away), and a formant parameter that represents what part of the physical model has the excitation applied to it (think of it as a way to specify whether you’re hitting the edge or the center of a plate, bar, or drumhead). Don’t be fooled by the elegant and simple layout – there is a world of tweaking and complexity in this portion of the plug-in alone. That’s interesting enough entirely on its own, but we’re only halfway through. The Objeq delay takes the filtered and excited input signal and routes it through a fully featured dual delay line that plays quite well with your plug-in host’s tempos. The initial delay line applies a delay to the input signal (either at a host-synced note value/multiplier rater or straight-up milliseconds), and the second delay line functions as a feedback loop. You can adjust the delay lines individually, link them together, and ping-pong the results (all with the help of another judiciously placed pair of high and low-cut filters to further refine the results). We’re almost done - over at the left-hand side of the plug-in, we’ve got the ability to modulate any of our parameters using a host-synchable LFO. As is the case with the delay module, it’s got the features you’d expect (selectable waveform outputs – sine, triangle, square, ramp, and a random ramp - and the same host sync controls you’ll recognize from the delay lines) and a few nice touches, as well – phase offset and the ability to choose the modulation mode (bipolar or unipolar positive or negative, along with a level adjustment). Simply set your LFO, choose the parameter you want from the drop-down menu, and you’re off to the races. As the preset banks that come with the device would suggest (particularly the stuff that Richard Devine put together for them), this is a deep and subtle piece if kit. The only possible quibbles I can imagine might involve wondering why there’s only a single LFO or why we can’t specify base frequencies for the resonators as MIDI note numbers – but those are trivial issues for Max or Max for Live users. You can just patch the control you want and sent standard VST plug-in messages to the device. This is a beautiful piece of kit, whether you’re interested in more traditional bread-and-butter things like kick drum enhancement or delay-based doubling, workouts from the dual delay lines, or considerably more exotic pairings of the resonators with modulation sources. As you tweak, you’ll also really really appreciate the History and Compare features of the device, which give you access to all of the tweaks you’ve done since you loaded the plug-in (I owe the AAS boys a pint for that feature alone). I guess you could say that I am now officially Objeq oriented.